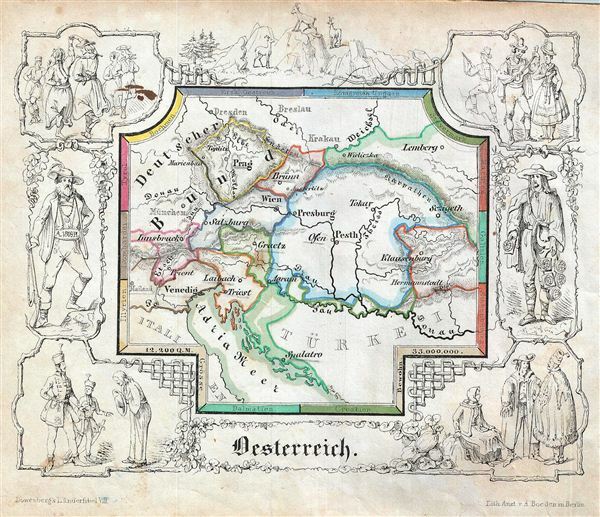 A delightfully whimsical 1846 map of Austria, from a German kinderatlas or children's atlas. The map details the Austrian Empire at its peak and covers from Lemberg (Lviv) to Dalmatia with divisions shown by color coding. The whole is surrounded by a wide border featuring charming vignettes meant to illustrate the peoples and cultures of the region. The border of the map itself names the constituent lands of the Austrian Empire. The border illustrations include couples dancing, a man serenading a woman, portraits of two men on either side of the map, goats, a man bowing to two men in uniform, etc. The map is accompanied by its adjacent page, which includes a poetic history of the Austrian Empire in German gothic type. The wonderful and rare map was drawn by Anst. V A. Boeden of Berlin for inclusion as plate no. IX in the 1846 issue of Julius Loewenberg's Geographische Landerfibel. Very good. Even overall toning. Blank on verso. Minor stain on top left illustration.